Julien Diana and Yannick Simoni of the “Immune Mechanisms in Type 1 Diabetes” (Inserm/Université Paris Descartes), directed by Agnès Lehuen, have just published the results of their work on type 1 diabetes in the Nature Medicine journal. This is a disease characterised by the self-destruction of the p pancreatic cells that produce insulin. The researchers reveal the role of the innate immune cells, especially the dendritic cells, that cause the activation of the killer T-lymphocytes whose action is directed against the p pancreatic cells. 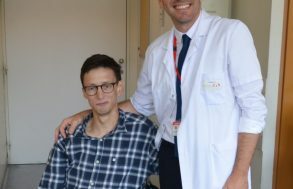 The results obtained in mice make it possible to consider new ways of regulating the auto-immune reaction generated by the innate immune cells. 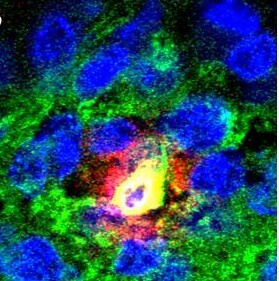 The work of the team working on “Immune mechanisms of Type 1 diabetes” (Inserm/Université de Paris Descartes) in NOD (Non-obese diabetic) mice, the model used for studying Type 1 diabetes, reveals the essential role played by the cells of the innate immune system that were not hitherto considered to be involved in diabetes. These cells were known to play a role in other auto-immune diseases such as lupus and psoriasis. 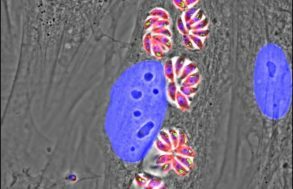 In this study, researchers managed to describe the mechanisms initiating the activation of T lymphocytes attaching themselves to the pancreatic β cells. The innate immune system is normally activated when an infection occurs. 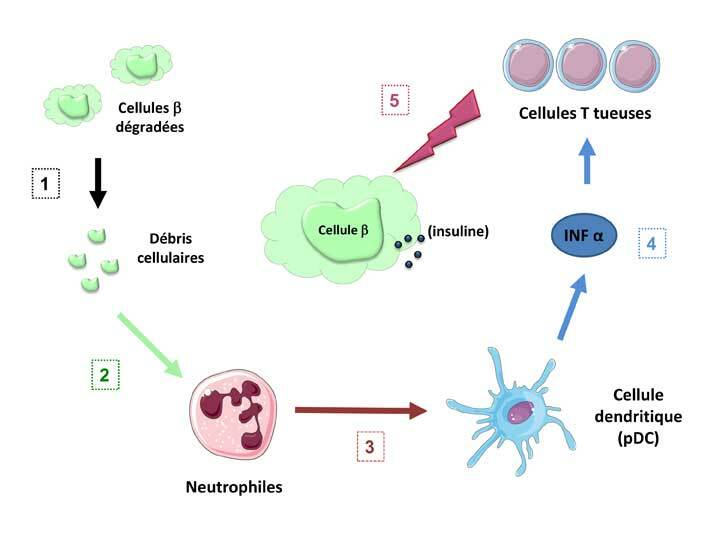 This is when the mobilisation and activation of neutrophils and dendritic cells is observed, constituting the first stages of the immune response. Abnormally in NOD diabetic mice, the natural physiological death of pancreatic β cells, occurring as the process progresses, involves an innate auto-immune response in the pancreas. Researchers have provided details of the introduction of a sequence of activation events in these innate immune cells in the Islets of Langerhans. The natural deterioration of the β cells (1) leaves cell debris in the tissues that abnormally activate the neutrophils (2). These alarm cells in the immune system warn the dendritic cells (pDC) (3) which in turn cause the production of IFN α interferon, an alarm molecule (4). The interferon α then stimulates the T lymphocytes which, by recognising functional pancreatic β cells, cause these cells to die (5). C) Photograph of the Islets in untreated mice in which the killer T-cells (white arrows) can be observed. 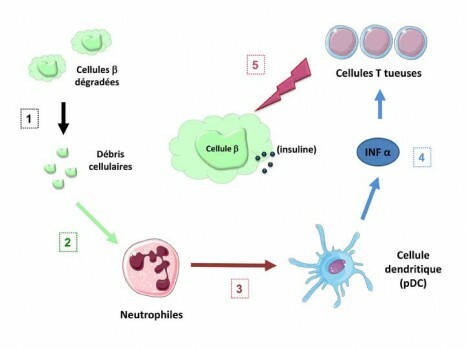 “We have observed in mice that treatment prevents activation of the innate immune cells, neutrophils and dendritic cells, warning of the onset of diabetes by inhibiting the appearance of auto-immune T responses aimed at the pancreas” explains Agnès Lehuen, head of the Inserm team. These results show, for the first time, the important role played by innate immune cells in the sequence of events leading to the onset of Type 1 diabetes. Researchers continue to strive to understand how to regulate the auto-immune reaction produced by dendritic cells without compromising the innate immune system, an essential one in cases of infection. Several routes are being taken to attempt to regulate the production of the INF α alarm molecule that precedes activation of the killer T-cells, for example, by specifically targeting certain activation routes for the pDC dendritic cells. “These therapeutic approaches are currently being tested in other auto-immune diseases such as lupus and psoriasis. Such innovative treatments could be useful in the prevention of Type 1 diabetes. It will first be necessary, however, to perform studies in diabetic and pre-diabetic patients to be able to better understand how the innate immune cells function, something that has not been studied until recently in auto-immune diabetes,” concludes Agnès Lehuen. The research benefited from a grant from LabEx INFLAMEX as part of investment for the future and for the Ile-de-France region. System present from birth that makes it possible to initiate an immune response to infection, regardless of the infectious agent involved. It is distinguished from the “acquired” or so-called “adaptive” immune system that is a specific response involving recognition of the infectious agent and the memorising of the infectious event. 1Institut National de la Santé et de la Recherche Médicale (INSERM), U986, Paris, France. 2University Paris Descartes Sorbonne Paris Cité, France. 3INSERM, U781, Necker Hospital, Paris, France. 4Department of Medical Biochemistry and Biophysics, Karolinska Institute, Stockholm, Sweden. 5Dynavax Technologies Corporation, Berkeley, California, USA. 6These authors contributed equally to this work.